Really though, I'm excited to have a 4th boy. It has a nice even feel to it. just to preserve my femininity! We're fresh out of boy names around here! Congratulations April!!! FOUR boys! How fun! You'll definately need regular girls nights out. :) Take care of yourself, pampering and all! names? i love thinking of names. We are super excited for you! I think 4 boys sounds awesome! 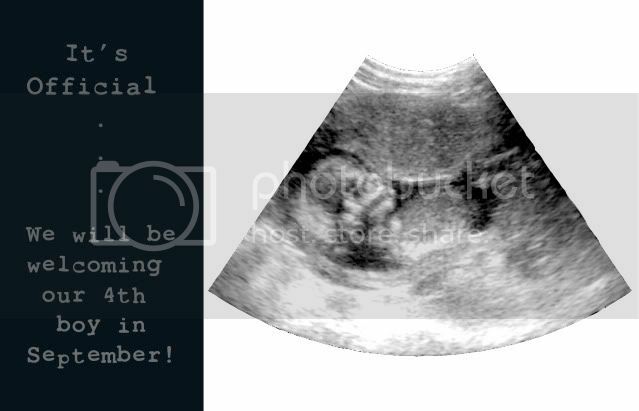 Wow, another boy, congratulations! That is so exciting! Congrats! How fun is that, another Boy! naming is one of the best parts! funny you would suggest that name! my father-in-law's name is Quinn. krista really wanted to name her next boy Elijah and call him Eli, but, it was the name of one of her GOOD friends new baby boy, so she can't really use it....so you should, it is pretty cute. Elijah Quinn. that has a nice ring to it. good idea... too good. We already have an Eli! our second. you know after i wrote that, it dawned on me, but i wasn't sure....dang i gotta keep better track! April...congrats..I totally thought I already left a message, but I guess I didn't. I think four boys are great. I'm happy for you. Names...well, I think I suggest this one before, Ryker.